For sauce: In a small bowl, stir together all ingredients. Cover and refrigerate for up to 2 days. For fries: In a large bowl, place cut potatoes, and cover with cold water. Let stand at least 30 minutes or up to 2 hours. Drain potatoes well, and pat dry. Line a large rimmed baking sheet with paper towels. Place a wire rack over prepared pan. In a large Dutch oven, pour oil to a depth of 4 inches, and heat to 300°. Fry potatoes, in batches, for 5 minutes, just until cooked through but not browned. Remove from oil, and place on prepared rack to drain. This process can be done up to 2 hours before next frying. 4. Increase oil temperature to 375°. Fry potatoes, in batches, for 3 to 5 minutes or until browned and crisp. Remove from oil, and drain on paper towels. Sprinkle with salt. Serve immediately with sauce. 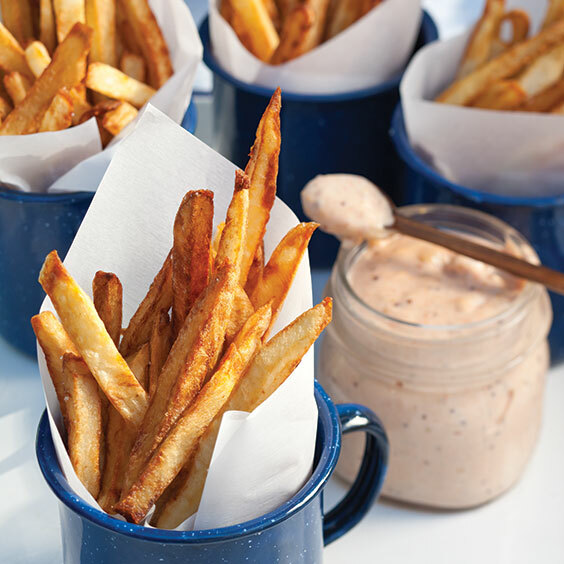 Double-frying french fries produces crisp and golden results just like the ones pictured here. The first fry cooks the potato and seals the outer surface. The second fry makes them golden brown and crisp.